As some retailers struggle with merchandising hardware effectively and in an impactful way in store, there is a need to consider the wider retail strategy in order to make these ‘bread and butter’ items jump out at the customer. 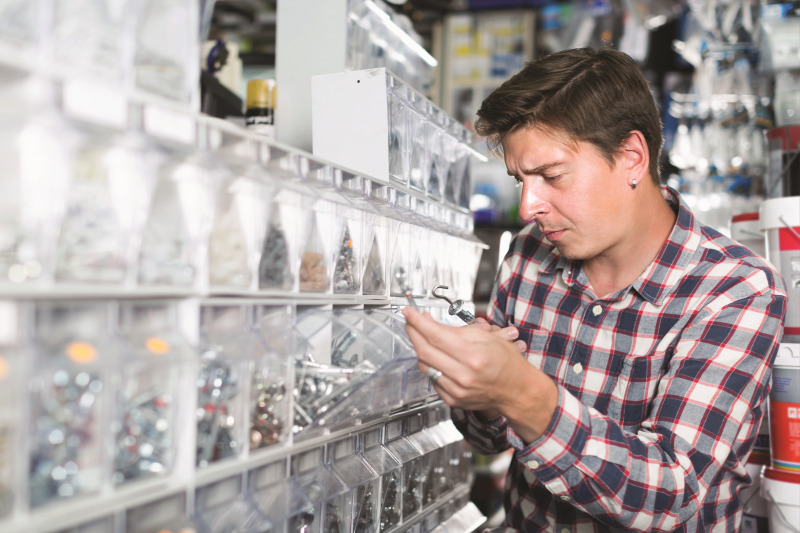 When looking at crucial items for the DIY retail trade, retailers face a frequent challenge when considering how to make smaller essentials – quite literally the ‘nuts and bolts’ of the business – stand out. Across my years of working with retailers in the DIY trade to help them maximise the impact of their merchandising, we always start by working to the adage; right product, right place, right price. It might sound obvious, but in a 24-hour economy where consumers are marketed to via mobile phones and online retail at all times and places, and are able to shop quickly and conveniently, if the offline shopping experience doesn’t mirror the ease of online, customers will simply walk away. By taking a step back and looking at the wider retailing strategy, ensuring that stores are laid out in a logical pattern (paints near brushes, bathroom fixtures next to larger bathroom items, etc.) any possible frustration customers might experience when trying to find specific items is eliminated. Fortunately for the DIY trade, it is one area of retail where customers prefer to have the tactile experience, viewing the items (especially higher-ticket items) up close before buying. DIY is also an area where the opportunity to maximise the impulse or ‘just in case’ purchase is huge. Many customers only visit DIY stores for specific larger-ticket or problem-solving items and will take the opportunity to stock up on essentials during these visits. If relevant fixtures and small add on items are displayed prominently, attractively and at appealing prices in logical locations (wall plugs and screws next to drills, for example, then they will provide perfect incidental purchases for these customers. Clear, eye-catching labelling seems an obvious consideration, but it is crucial. More recently, as a nod to the fact that many DIYers will only ever need small quantities of screws and other small fixtures, a ‘pick your own’ concept based on single unit sales valued by weight allows customers to get exactly what they want and nothing they don’t. For pre-packaged items, retailers need to ensure these packages are robust to withstand handling by multiple customers, and that everything is clearly labelled to include its size, specific use and price clearly. Regular organisation and checking items to make sure that displays stay the way they should is crucial. Finally, to maximise sales of these items, grouping small items in a complementary and logical way; screws and plugs of similar sizes and material together can pay dividends. When looking to optimise sales of smaller-ticket essentials in the DIY trade, it’s vital that retailers are paying attention to every element of their operations. From store layout and fixtures, lighting and signage, to special offers and the training staff receive, staff availability and standards of service through to the ease of check out and ordering, the whole experience needs to be seamless and customer orientated, so they are not tempted away by the convenience of competitors.